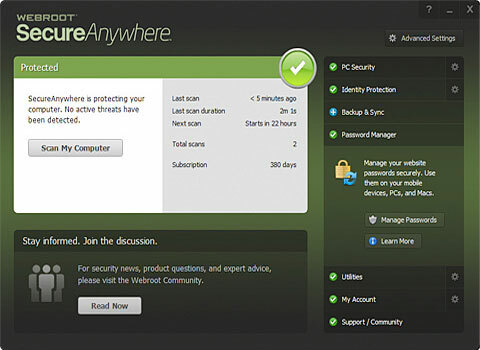 In addition to being an antivirus program, Webroot SecureAnywhere is also an antimalware meaning that it could remove worms and malicious software which infect systems. It also stops harmful and infected websites while users surf web. This antivirus is also capable of protecting users against spyware (programs which collect and steal sensitive information), and rootkits. Low computer RAM usage – many similar products in the market take way more than just about 5MB of RAM which is the amount taken by Webroot SecureAnywhere Antivirus in the system idle time. Low hard disk space usage – Webroot software only needs about 2MB of hard disk for installation. Compare this number with about 770MB for Kaspersky, 730MB for Norton Antivirus and 300MB for McAfee. The main reason for this is that Webroot virus definition databases are cloud-based and not saved locally on the installation disk drive. 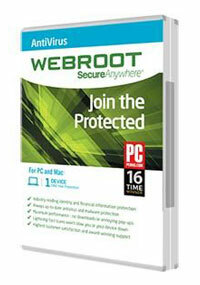 Low installation time – it takes only 5 seconds for the Webroot antivirus to be up and running. Other antivirus products take much longer to be fully ready for scans: 62 seconds for Norton, 93 seconds for Kaspersky and 500 seconds for McAfee. Fast system scans – according to the numbers given by the official website, Webroot software performs system scans and scheduled scans at a higher speed rate compared to the competitor applications. Instead of using local databases, which permanently need updating, Webroot antivirus software uses cloud-based servers in order to identify possible threats on the system. Whenever the program encounters a suspicious file or program on the computer, it queries the cloud database about that, and in case the program is malicious, Webroot SecureAnywhere immediately removes it. Another interesting fact about this antivirus is the way it identifies new threats. For example, consider the application scans the computer and finds an unknown program with suspicious actions which might be a virus, spyware or malware. In addition to monitoring the suspect software, SecureAnywhere sends detailed information about it to the server for further analysis. After that, possible relation to existing threat might help to discover the true identity of the unknown program. If necessary, even human researchers join the investigation for further analysis. So if the software turns out to be a virus or malware, the antivirus software ends it right away. And the new identified threat will be added to the database for future queries. One of the weaknesses of this method for identifying trusted or untrusted programs is that the internet connection should always exist in order for the SecureAnywhere to be able to contact the database servers. So if there is no internet connection, the software treats all previously unlaunched programs on the computer as unknown or possible threats. Of course the condition will be changed whenever the cloud server contact could be done again. Webroot SecureAnywhere software has a simple price plan: 1 year licenses sells for $29.99 per year, $59.99 for 2 years and $89.99 for 3 years. The prices are the same for Mac OS X and Windows based computers. There is also a money back guarantee for 70 days. For more advanced features users could get SecureAnywhere Internet Security Plus for $44.99 per year. Extra options include accounts logins and passwords protection and smartphones/tablets security. Users could also download a free trial of the software.